The renewed vigor that appeared at the end of the second season of The Legend of Korra sticks around for Book Three: Change, which hits the ground running and rarely lets up, making it the most focused and action-packed cycle of the animated television show so far. The Legend of Korra - Book Three: Change picks up not long after the major spiritual events of the previous season. Korra (voiced by Janet Varney) has created a stronger link between the physical and mystical realms, and the effects are both good and bad. Her home, Republic City, has been overrun with out-of-control vines, a predicament that has earned her the ire of the populace. The mayor banishes her from the city, but it ends up being more opportune than intended. It's a good time for Korra to get out of town, since another major development is that new airbenders are randomly appearing all over the place. Up until now, Korra's trainer, Tenzin (J.K. Simmons), and his family have been the only remaining users of this particular talent. This gives Korra the mission of travelling around and recruiting the new benders to join the Air Temple, allowing Tenzin to re-establish his tribe. 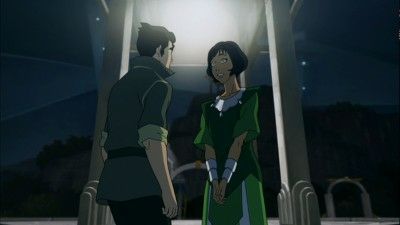 Along for the ride are the usual cast of characters: the brothers Bolin and Mako (P.J. Byrne and David Faustino), Korra's new bestie Asami (Seychelle Gabriel), Tenzin's daughter Jinora (Kiernan Shipka), and eventually police chief Lin Beifong (Mindy Sterling), whose family ties become important mid-way through. Her sister (voiced by Anne Heche) is just one of many new characters joining the cast, with some proving more substantial than others, including the fresh airbenders, a child thief named Kai (Skyler Brigmann) and Lin's niece Opal (Alyson Stoner). There are also some new major bad guys, a quartet of evil that has designs on taking out the Avatar. 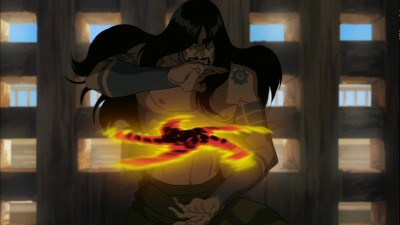 Their leader, Zaheer (Henry Rollins) has a renewed determination to bring about the end of life as everyone knows it, since he is also one of the unexpected airbenders. 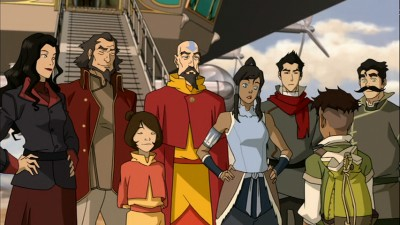 The rest of his team include representatives from each element, making their combined might equal to that of Korra's. The plot to take down the current system spans the season, as Zaheer reveals his real intentions and why he's intent on tracking down and capturing Korra. Things are further complicated by the Queen of the Earth Kingdom wanting to turn the airbenders under her rule into a special army, and she's also not that averse to kidnapping people beyond her city's walls. Individual episodes offer up distinct obstacles as the writing team builds the macro plot, leading to a multi-episode finale where forces clash. One thing I noticed right away with The Legend of Korra - Book Three: Change is the improvement in the animation. While there has rarely been much to complain about in previous seasons, this cycle seems more consistent, with characters sticking closer to model and the action appearing more fluid. Apparently much of this is down to the production team beefing up the at-home design department, which could explain for some of the more inventive ideas, like the armless waterbender Ming-Hua (Grey DeLisle), who has replaced her limbs with streams of water she can manipulate. Regardless, the smoother animation just ups the stakes for the characters, and encourages added audience investment. The Legend of Korra - Book Three: Change collects 13 episodes and spreads them over two discs, watchable one at a time or through the play-all function. The cartoons are shown at their original broadcast ratio, widescreen, and look fantastic. Colors are bright, resolution is amazing--I think this one actually looks the best of all the sets so far, honestly. It might be down to the general improvement in animation, or someone is paying attention back at the studio. The main English soundtrack is mixed in 5.1. Dolby Digital, and as per usual, sounds great. There are lots of nice details throughout, but there is even more to appreciate when the scenes get loud. The audio has lots of boom. 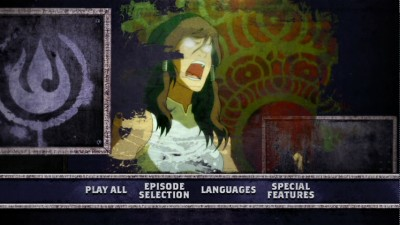 A Spanish dub is also provided in 2.0 stereo. The double-disc set comes in a standard-sized dual-tray case with an embossed outer slipcover. Bonus features are spread across both discs. The main extras are four audio commentaries. They are on the first two episodes and the last two episodes, and they feature show creators Michael Dante DiMartino and Bryan Konietzko alongside producer Joaquim Dos Santos. The finale also adds composer Jeremy Zuckerman. There are also four "The Spirit of an Episode" selections, short featurettes about specific installments. They include peeks at the early animatics, as shown in the screengrab above. Note: We were not sent the Blu-ray for review, but apparently it contains commentaries and featuretettes on all 13 episodes. Highly Recommended. The Legend of Korra - Book Three: Change sees the animated series finding its legs, delivering an action-packed story cycle full of compelling character s and genuine dramatic developments. The animation is also stronger than ever before, making for a set that any fan of the show will enjoy front to back.